Freshmen ruled at the Bagel Brunch held during Welcome Week in their honor. Great food, cool people and ice breakers that were actually fun, made for a great way to meet new people and hear all about what Chabad has to offer. Freshmen, returning students and even some parents enjoy dinner at the Chabad Cafe on move in day at Binghamton. Hugs, hi-fives and big smiles abounded at the Welcome Back BBQ as returning students and newbies alike enjoyed the food and great weather while reconnecting or getting acquainted. Students also had the opportunities to peruse the information table and see all that Chabad has to offer and in keeping with the custom, all listened quietly to the sound of the Shofar that prepares us in the month of Elul for the upcoming New Year, Rosh Hashanah. Apple picking, raspberry picking and playing with the farm animals all made for a delightful afternoon and another opportunity for the great people of Chabad to have fun and bond. Some intrepid souls came home and had even more fun making delicious kugels and cakes in the Chabad kitchen. Jewish? Greek? Can you be both? at Binghamton it's real easy! Chabad hosted a beginning of the year intra-Greek BBQ for all the Greeks to get to know Chabad and the many fantastic ways in which we work together. Yummy! Each year, since the first anniversary of 9/11 Chabad organizes a campus wide Mitzvah Marathon to mark the tragic day in our nation's history and offer the university community a plethora of easy, accessible ways to do a good deed in honor and memory of those who fell on that day. The program brings to life the important adage: turning tears into action! Welcoming a New Sefer Torah to Chabad! On Sunday, Sept. 15, Chabad joyfully welcomed a Sefer Torah donated by the Friedman family ( parents of alumni Stephanie '11 and Yechiel '13). The spectacular event began with a lively procession from Hayes. the old Torahs at Chabad came out to meet the new Torah amid great dancing and festive music and lively Hakafot were held in the Shul. The event concluded with an elegant and delicious luncheon marking this special occasion. Lots and lots of happy students enjoying mixing, kneading, shaping and baking Challah and learning all about the traditions and history surrounding the most delicious bread in the world! A moving kumzitz-- rousing songs interspersed with words of contemplation and introspection -- was led by Saul Blinkoff in preparation for the Selichot services that followed. Saul Blinkoff, Hollywood animator and director served as scholar in residence for the weekend at Chabad entrancing students with his life story and insights. Early on a Sunday morning these intrepid students rose to study about the upcoming holiday, Rosh Hashan and create their very own Shofar from a raw horn! The first Girls Night Out for Fall 2014 drew a large crowd of BU women eager to connect, bond, learn the art of sushi rolling, enjoy great Rosh Hashana treats, and have fun playing minute to win it. After a day of meaningful, heartfelt Yom Kippur services students davened Maariv, heard Havdallah and then enjoyed a bagel break the fast. Chag Sameach- time to get excited for Sukkot! 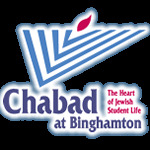 First year students enjoyed a guided tour of Binghamton by native, Charles Gilinsky, Bowling, a trip to Wegmans and Kosher Pizza from the Chabad Cafe. Welcome to the Southern Tier, the Carousal Capital of our Country ! The Chabad sukkah was buzzing with events all week; welcoming sororities, fraternities - through JEGABU - and other social groups for special gatherings that highlighted the special Mitzvot of Sukkah: "dwelling" in the sukkah and blessing over the four kinds.Chabad brought Mitzvos on the spot to people on the go by bringing the Sukkah Mobile and and a Pedi-Suakkh on to campus. Hundreds of students did the "Lulov shake". Hundreds enjoyed the annual Jazzukah celebration: great food, music, and company in Chabad's giant but really warm and cozy sukkah. Can't wait for next year! The lovely ladies of Chabad enjoyed a luxurious spa night with all kinds of services offered, heart warming words of Torah connected to physical beauty and a sumptuous array of desserts a their monthly Girls Night Out in honor of the month of Cheshvan. Once again, the talented Jewish women at Binghamton strutted their stuff and what a show it was!song, dance, poetry, photography,drama, comedy, art.And the desserts were to die for! Residents of CIW enjoyed a musical Havdallah hosted and organized by Ariel Broom, Chabad's director of engagement. Rabbi Akiva Weiss, JLIC rabbi, led the Havdallah. Students enjoyed a musical Havdallah, hot coco and some delicious snacks. What? Get up "early" on a Sunday morning? Yes! it's worth it for paintballing. Participants on this trip had a blast!